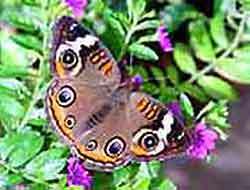 Pictures and information of some common types of butterflies you may see around your house. 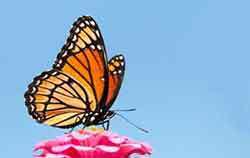 Find out how to tell a Monarch butterfly from a Queen butterfly that looks very similar. Learn how to tell a moth from a butterfly. Click on the images to go down the page for more information. how do you tell a butterfly from a moth? Swallowtails probably are the most remarkable of the many types of butterflies. They are fairly large (3" to 6") and they have an elongation on the end of their hind-wings. 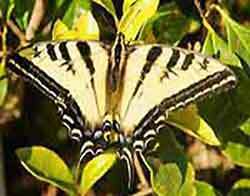 There is often a false eye on the swallowtail. It is their protection to keep birds from pecking their real eyes. 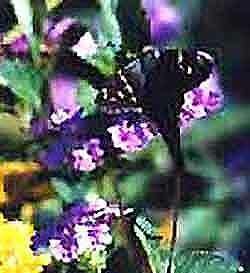 Black Swallowtails are common in the eastern United States and down to South America. They have an orange spot on the back of the hind-wing. The orange spot has black in the center of it. 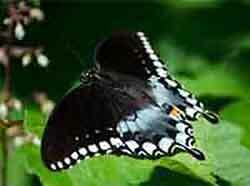 The male and female Black Swallowtails may differ somewhat in their coloring. Some resemble the Spicebrush, but lack the orange spot. The bluish on the hind-wings may be blue or white. The Spicebrush has a solid orange spot on the back of the hind-wing. 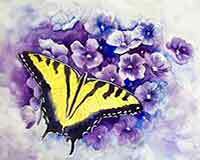 3 1/2" to 4 3/4"
The Giant Swallowtail Butterfly is a large 6". It is found east of the Rockies, all the way to South America. It has bright yellow and black markings on the top. The underside is pale yellow with black markings. The Palamedes is seen in the swampy areas along the eastern United States down into the gulf coast area. 4 1/2" to 5 1/8"
This beautiful butterfly is seen from the Great Lakes to Southern California and down into Central America. 2 3/4" to 3 1/2"
This stunning butterfly is one of my favorite types of butterflies. It is large and it flies so softly. The western Tiger Swallowtail is a bit smaller than the Eastern. It has an orange and blue spot on the hind-wing. The female has bluish on the end of her hind-wings. There is a brown form of the female Tiger Swallowtail. 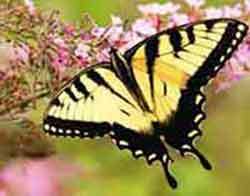 The Zebra Swallowtail is found in the eastern United States. It is black and white with no yellow on it. The Zebra Swallowtail may be confused with the Tiger Swallowtail. It is noticeably smaller with no yellow. Milkweed butterflies are one of the best known types of butterflies. They get a chemical from milkweeds that make them taste bad to their predators. 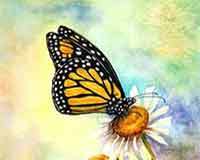 You may see the Monarch Butterfly from southern Canada, across the United States, down to South America and out in some of the Pacific islands including Hawaii and New Zealand. The Queen Butterfly is seen from southern California to So. Georgia, Florida to Argentina. The Queen lacks the black veins of the Monarch. 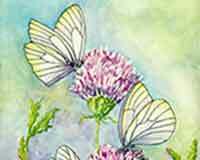 Butterflies and flowers, especially daisies are two of my favorite subjects to paint. I enjoy painting them with watercolor or oils. The Queen's underside resembles the Monarch. 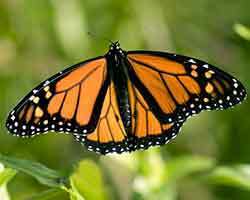 But the Monarch does not have white spots out in the middle of the orange fore-wing. The front legs of the Brush-footed Butterflies look a brush. They walk and stand mainly on their back legs. We probably don't look at their legs but many of these types of butterflies are in our gardens across the United States. This lovely little butterfly is seen throughout many parts of the world. Painted Lady butterflies have very interesting patterns on the underside of their wings. The American Painted Lady has a large eye-spot on the back wings. The Painted Lady does not have this eye-spot. 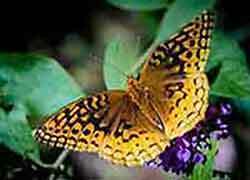 The Great Spangled Fritillary is common throughout much of the eastern United States. I see the Buckeyes often and they are one of my favorites because I see them so often. They reside throughout the United States, southern Canada and some of the Caribbean. 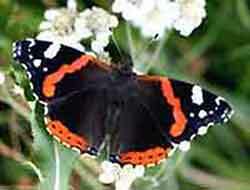 The first time I saw a Red Admiral Butterfly I was amazed at their brilliant red coloring. It is seen throughout the United States, Europe, central Asia and North Africa. 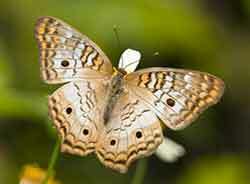 The White Peacock Butterfly is seen in south Texas, part of Florida and down through Mexico, Central America and into Venezuela. 2 1/8" to 2 3/4"
The Pearl Crescent Butterfly is found thru out much of the United States (except for the west coast), parts of Canada and Mexico. 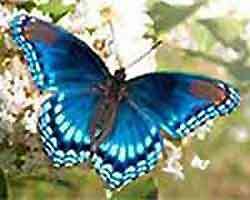 This beautiful butterfly is seen in much of the eastern United States. 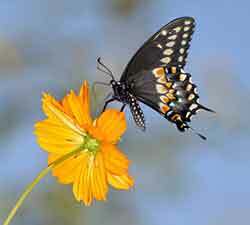 It mimics the Pipevine Swallowtail which is toxic to birds. But it has no swallowtail. 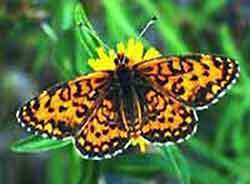 The Question Mark Butterfly gets its name from a question mark on the underside of its hind-wing. It is from southern Canada and in the United States east of the Rocky Mountains, except Fl. The Viceroy may be confused with the Monarch, but it is smaller. It has a heavy black band across the hind-wing. The Monarch doesn't have the black band. It is seen in the United States east of California. The band on the hind-wings also shows on the underside. The wings of the Longwing Butterflies are much longer then they are wide. Longwings are actually part of the Brush-footed Butterflies, but who looks at their feet. It is much easier to see their long wings. Zebra Longwings are the Florida State Butterfly. They live several months longer than other butterflies. The Julia Butterfly, sometimes called Orange Longwing is actually a brush-footed butterfly. But its wings are distinctly long. The Gulf Fritillary is one of the common types of butterflies in Florida. They have orange wings with dark spots. 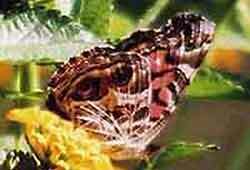 You may think they are different types of butterflies until you see both sides. They have large silvery spots on the underside of their wings. This Longwing butterfly is native to Mexico. 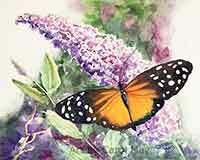 Visit the how-to paint watercolor page with longwing butterfly on a butterfly bush flower by the painting artist Carol May. Sulphurs and Whites are just like their names imply, either white or sulphur yellow colored. They are small, but more numerous. They are the most common types of butterflies. You may have seen Sulphurs puddling like this on damp soil. It is the males getting minerals out of the soil. I would always see the whites in the farm lands of California. 1 1/4" to 1 7/8"
When the Sulplhurs fly, they don't float, they are always flapping their wings. 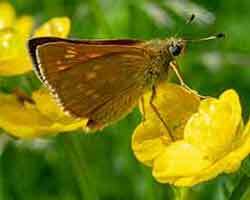 Skippers 'skip' from flower to flower. Their wings are small in proportion to their body, so they fly in a hurry. There are hundreds of skipper types of butterflies that are difficult for the amateur to distinguish. Following are three outstanding types that are easy to identify. All I know is this is a Skipper. The delightful little Checkered Skipper is seen from southern Canada to Argentina. These skippers are dark with a blue-green iridescence and the unmistakable long tail. They are seen from the southern United States to Argentina. 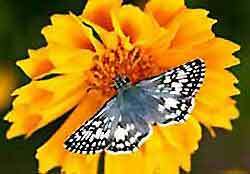 The Silver-spotted Skipper is seen from southern Canada down to Florida and northern Mexico. 1 3/4" to 2 3/8"
Butterflies and moths both have scales on their wings, but the moth's scales stand up on their body and wings. This causes moths to look fuzzy or furry. Butterflies usually are bright colored. Moths usually have duller colors. Moths sit and rest with their wings outstretched. Butterflies generally hold their wings up after they land. Butterflies are active during the day and rest at night. Moths are mostly nocturnal. We see them flying around lights at night. Butterflies make a chrysalis during metamorphosis. Moths spin cocoons with silk. The Sphinxs are a large group of moths. They are fast flyers and may range in size up to 4". The Luna Moth is a beautiful green color. It is seen across the United States and Canada. up to 5 1/2"
The Peacock Moth is a resident of Europe, rarely seen in the U.S. It is fun to learn the different butterflies in your yard. Whether you know the names of the types of butterflies is not as important as enjoying these beautiful gifts of God. I enjoy photographing and painting beautiful butterflies. 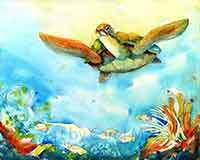 Check out some of my paintings. 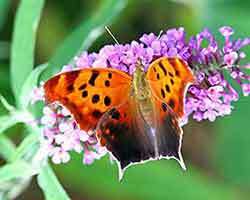 There are about 192 different butterflies and moths in the state of Missouri. Identify the Types of Hummingbirds seen in the United States.